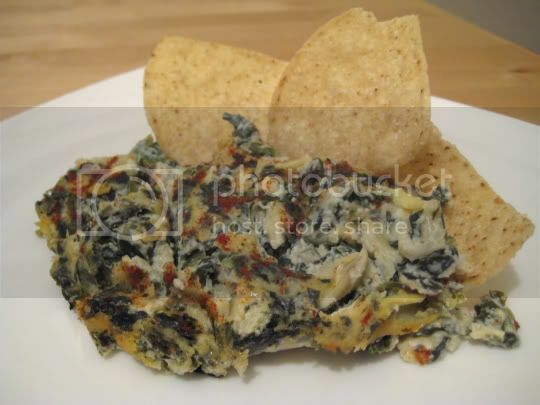 This recipe provides all the flavor of a standard spinach-artichoke dip, but without all the fat! In fact, this is probably one of the most healthy versions of this recipe you'll try. Go to restaurants for that oozy, gooey, melty, creamy version...or try this very light version that actually gets its texture from pureed tofu (trust me, you don't taste it). Only a little mayonnaise is used for added creaminess, and even that is the reduced fat kind. Dijon mustard adds a surprising kick, but it provides some serious flavor that goes quite well with the tangy artichoke hearts. Chopped spinach balances out those flavors, and a nice amount of parmesan cheese is added for a deep nutty flavor. And not only is this dip healthy for you, but it was extremely easy to make and is best served warm. Tortilla chips were good with it, but spread on baguette slices would make this even more of a meal. Make again? Definitely. There's no reason to go back to the fat!